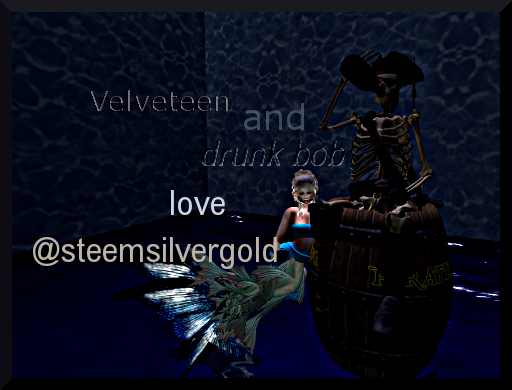 So recently I found @steemsilvergold a lovely friendly and informative community here on steemit and I have finally feel like I found my place in steemland, took a wee while! I cannot claim in any way to be any kind of expert in these matters, I can tell you I started collecting coins in May this year, so only a new tiny stackling I am! The reason I got into it was that at the beginning of this year I found crypto and I have to say I have never bought any crypto, I did not have the funds to do so. So I began in January collecting from faucets, a tiny bit of mining, yup with my laptop that's it, and I was happy. I love crypto. In May of this year, it was my friends birthday, I wanted to get him a birthday present, funds at that time were limited. I wanted to get him something of value yet not too expensive, this friend had last year asked me about bitcoin; what did I think/know about it, at the time I knew nothing and said so, but I am a natural-born researcher and went off found out everything I could about bitcoin, and it took me around 4 months until I finally took the plunge and hit the faucets. During that time he had asked once more what I thought and this time I was confident in answering, as I did, it kept coming to me that although crypto was good some inner voice kept saying 'buy gold'. You can probably tell I am going to say funds at that time did not permit me to buy gold, and I was left simply giving him the advice. He didn't take it. So back to his birthday and I decide to finally look into precious metals and found a website where I bought my first silver Canadian maple leaf, as always I had researched it, although at that time all I researched was the best silver to buy and the most trusted website, so nothing in depth. Each time I had enough I bought one silver maple leaf, I was happy, building up my little store of silver for the future. I had also during this time flirted with the idea of writing on steemit and after a while found the lovely ssg community and through reading a lot of their posts I discovered that there is a whole world of gorgeous silverness out there. I now have a love for collecting vintage coins and silver ingots, don't have any ingots yet, but the dream is alive. I have recently tried to put all my hard earned faucet collecting crypto into buying steem, for a few reasons, but the main drive I have at the moment is to reach one steem, so I can enter a raffle for some silver, I fell in love with a sunshine bar that was in a raffle that unfortunately finishes today , I dont have enough steem yet as I said the only crypto I have is from faucets and it is just little me manually clicking on pictures of cars to prove I am human. I still love crypto, I also love silver and gold too, as soon as I have enough then I will buy a gold coin. I will be very happy then! 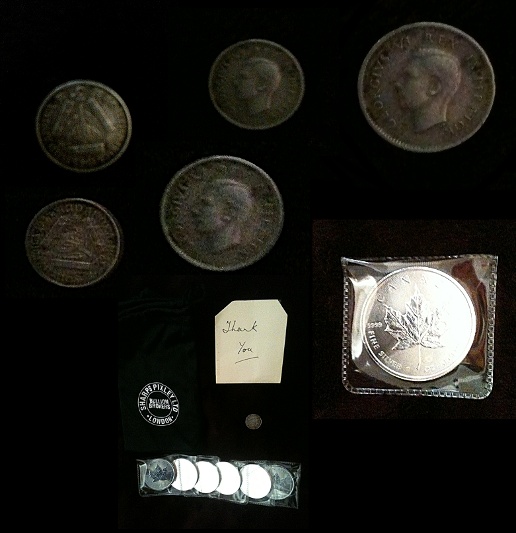 My total collection so far is 7 silver maple leaf coins, one George V1 sixpence dated 1940, and a tiny south africa 3d dated 1943 at least that's what it says on it, I tried to take close ups though please bear in mind I only have an old iphone3 and I am not known for my photography abilities. The two vintage coins I won on ebay auction and have now become firmly addicted to watching ebay old coins and excited about growing my collection of both old and new and ingots and everything lol as you can see I may be just a tiny stackling but I have dreams and really that's all there is too it; once you have what you need in life then you follow your dreams, just keep the dream alive ! As long as you are holding some silver ( doesn't matter how much) you are ahrad of 99.5% of people on this world. Welcome to SSG. but to be honest with you, we gotta work o that 38 reputation you are carrying right now. @thedamus has passed of his daily vote to you. Thanks for posting up about metals. No for the fun part, cause you are about to get hammered! Rep is now 41, much better. Yeah baby!!! That’s the way we do it — thanks Hammer!!! hi thank you for this i have to say the more technological side of steemit eludes me :( i have never understood about rep or delegating any of those complicated things you should see me panic when i buy steem! even the blocktrades page panics me lol :) i get one of the teenagers to do it i have to i already messed up a doge wallet! however i do understand that the numbers look different and that somehow i am now a different rep and that is is due to the lovely people in the ssg community i am still getting used to everyones names and who is who so please can i say thank you to veryone though i am beginning to recognise some people i am 52 and my memory has never been my strong point :) a huge thank you and also yes i am holding my silver i am celebrating my silver and i am loving my silver :) soon i will achieve full stacker status ! the best thing is being able to share this adventure with all of you, time to don me eye patch there be treasure out there! much love and respect to all ssgians lets find that treasure ! Hi velveteen, i have just finished reading a couple of your posts and wish to welcome you aboard. Y’Arrr Matey! You’re going to like it here in #SSG. I am going to nominate you for new membership into #steemsilvergold on our private discord channel, i am sure someone will second you, and then at the very least you will get a small upvote from our community bot — more on that later. Also, i will reateem above article so some more peeps see your stuff. I think Ron’s advice above is good, but you are already doing great with what you are stacking. Just keep on being you and use #steemsilvergold when appropriate — you’ll soon meet all the scallywags ‘round here. hiya, that is absolutely brilliant a huge thank you! best news i have had all day, very chipper now :) i am very much an obsessed stackling person and chuffed to bits to find this excellent comment and wonderful nomination, over the moon! many many thank yous i really appreciate it! many thanks also for reading my posts i appreciate that and i shall now go make food for many teenagers whilst dreaming of silver :) a huge thank you to all ssg coomunity for making me feel welcome and for being the friendliest people i love ssg! much respect to you thedamus and thank you for your kind welcome ! cant resist doing a tiny happy dance! Hey just to let you know, you have been nominated to become a member of #steemsilvergold by @thedamus. You have received a second nomination and been confirmed by a community mod. Your name will be added to the membership list post released on Monday's. Also @thedamus nominated you to join precious voting bot for ssg and I have donated the 10sp so you will get a daily 1% upvote. On a sidenote if you power up your steem you will gain more band width so you can post, comment and reply a lot easier. Welcome, @beckieg! That is a great initial stack, and a good collection going! Keep posting and keep using the steemsilvergold tag. 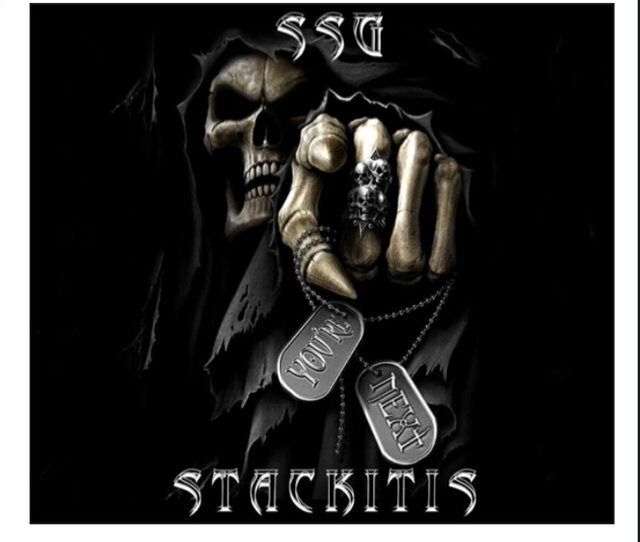 Soon you will meet the other stackers and coin collectors who are members of this community. Shinies can be addicting! BTW, I have a new series going here about STACKING FOR BEGINNERS part1, part2, part 3. It may be helpful to you. STack on, my friend! Welcome Beckie! Every stack has to start somewhere, and you're better off than most folks as long as you hold some silver and/or gold! Keep stackin'! Hi @beckig! Welcome to ssg! @thedamus welcomed me to the community when I was a new silver collector too. I got my first piece in December. In April I joined #ssg (thanks to @thedamus) and now I probably have close to 200oz! It is addicting. ☺️ Enjoy your new hobby and be thankful you are just trading one kind of money for another! Welcome and look forward to seeing more of your silver soon, we all had to start somewhere with out stack and having a mix is always a good thing. I read somewhere your in the north of the uk, i am based near manchester. My friend, that was only your first blog about coins. The size of your stack is not important. It is the love of stacking/collecting that drives us. As an old collector, I will give you one advice: Buy the book before buying the coin. That is absolutely important if you intend to be a collector. If you want to be only a stacker, you are doing very well with the Maple Leafs and the future bars/rounds. There you will find info about more than 90% of the coins that were minted along the world and time. Oh Welcome to #steemsilvergold @beckieg ! Great Start, just don't way over do it like me and turn into a crazy Poured Pirate silver freak like me. I got into Cryptos about four years back, my entire crypto holdings are from Faucets, except Steem. I'm currently fueling up my STEEM Power by converting my thought-to-be-useless but now HOT Dogecoin. Would love to see how you progress. Following! Oh my. I lost some Bitcoin in the same way. Live an Learn. Doge is cheap to transfer and when I started buying Steem I started with a little test amount before committing a few thousand at a time. And yes the fee on Bitcoin is unreal and despite its popularity I think it is long in the tooth compared to the more efficient and more advanced blockchains. On my Coinpot account I could cheaply convert between bitcoin, bitcoin cash, dogecoin, Litecoin, and Dash. The Moon site has been a good Faucet family to me for years. Got lucky a few times with Freebit and Freedoge faucets. Win some, lose some, and win some. So exciting to see a new slacker, so much to learn and so much to see, #ssg is an amazi g group,of people and a lot of fun too! Looking forward to seeing your stack grow, it is fun to add any new piece! You got a 2.92% upvote from @oceanwhale With 35+ Bonus Upvotes courtesy of @minnowpond! Earn 100% earning payout by delegating SP to @oceanwhale. Visit www.OceanWhaleBot.com for details! You got a 7.90% upvote from @joeparys! Thank you for your support of our services. 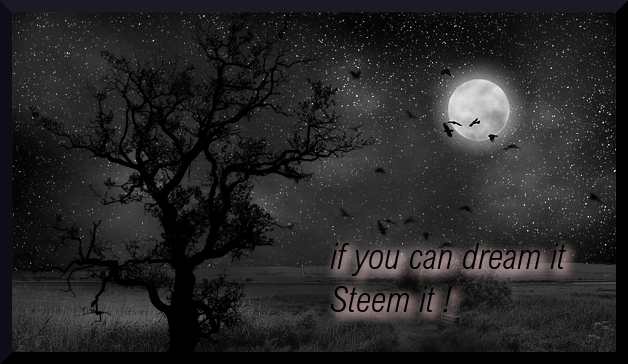 To continue your support, please follow and delegate Steem power to @joeparys for daily steem and steem dollar payouts! You got a 8.21% upvote from @dailyupvotes courtesy of @minnowpond! You got a 8.12% upvote from @minnowvotes courtesy of @minnowpond! This post has received a 18.44% upvote from @lovejuice thanks to @minnowpond. They love you, so does Aggroed. Please be sure to vote for Witnesses at https://steemit.com/~witnesses. @beckieg welcome to the steemsilvergold family! I have never found a more welcoming and friendly community than the precious metals community. Thanks for the awesome post!! Most everyone starts their stack from one piece, then another, then another.... enjoy the journey of stacking/collecting, as I feel there is no real 'destination'.